According to a recent article published in The Lancet, Australia has the fastest-growing rate of obesity in the world. The researchers found in a global survey that Australia’s obesity levels are, as of 2013, on par with those in the United States. 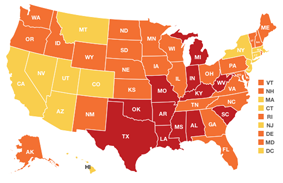 An excellent interactive map of US obesity rates from the State of Obesity Project shows the geographic trend across the United States. We set out to map the Australian rates of adult obesity by state, too, using the same categories and colour scheme. The warning in the Lancet article is that the rates of obesity are increasing all around the world. 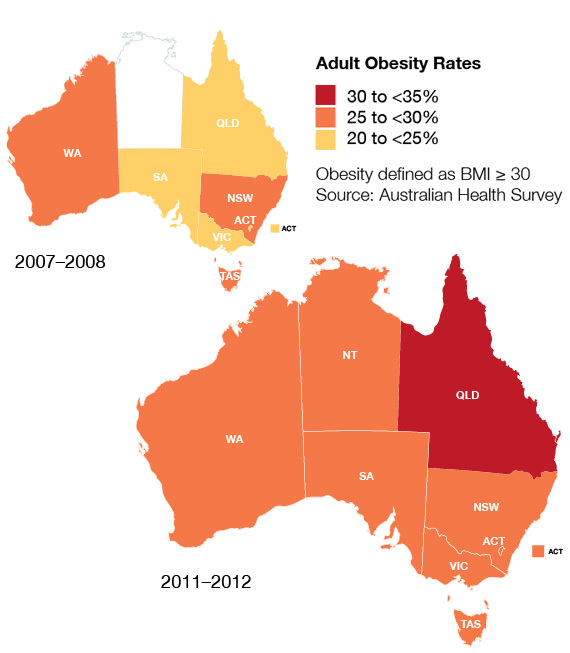 Note that on the US State of Obesity map of 2011, below, against which the main Australia map should be compared, there were not yet any states with an obesity rate over 35%. But there were two in 2013 at which time 34.9% of adults in the United States were obese according to the State of Obesity Project. In 1995 the rate in Australia was 18.7% and in 2007-2008 24.6%. The Australian Health Survey found the rate in 2011-2012 was 27.5% but growing quickly. Compare these rates with adult male obesity rates of over 50% in Tonga and over 50% in women in Kuwait, Libya, Qatar, Kiribati, Federated States of Micronesia, Tonga, and Samoa. In both the Australian Health Survey and the State of Obesity Project, obesity is defined as having a Body Mass Index of 30 or more. The State of Obesity Project site explains the terms obesity and BMI well. All figures used here are rates for adults but the picture for children is even bleaker. Students are encouraged to walk to school in October by VicHealth. One could also walk to school every day, of course. The Lancet article is Global, regional, and national prevalence of overweight and obesity in children and adults during 1980—2013: a systematic analysis for the Global Burden of Disease Study 2013. The Lancet, Volume 384, Issue 9945, Pages 766 – 781, 30 August 2014. Australian data cited above are catalogue number 4362.0 for state data and table 1.3 of 43640DO017_20072008 National Health Survey: Summary of Results, 2007–2008 (Reissue).